Reticent guitar player: "The equipment speaks for itself"
LOS ANGELES, California (CNN) -- There are rock stars, and then there are Rock Stars. Eddie Van Halen is a Rock Star. Eddie Van Halen wanted to create a guitar that was practically indestructible -- at least by him. Take an incident in the summer of 2007. A security guard stopped me as I attempted to drive through the gates of Center Staging, a rehearsal studio across the street from Burbank Airport. "That's odd," I thought. "They've never had security before. I wonder what's going on?" Pretty soon, I discovered the reason for the limited access. A black BMW convertible drove up, and a baby-faced teenager jumped out of the driver's seat. The passenger door opened, and out walked Eddie Van Halen. Everyone stopped talking and stared, including Ben Harper and the Innocent Criminals, who were outside taking a break from their own rehearsal. Van Halen and the other members of the band had just announced a big reunion tour with original singer David Lee Roth at a splashy news conference in Beverly Hills, and I had inadvertently discovered where they were prepping for their journey. Eddie and his son Wolfgang -- named for Mozart -- greeted a couple of people in the parking lot and quickly disappeared inside the soundstage. Moments later, the earth trembled as the loudest guitar I've ever heard in my life was fired up. It was like a sonic boom -- only the sound wasn't coming from the airport. It was coming from inside the soundstage. The legendary guitarist launched into the familiar intro to Van Halen's 1978 hit, "Ain't Talkin' 'Bout Love." That was followed by "Runnin' With the Devil." Joss Stone ran out of her own rehearsal studio -- barefoot -- and begged a security guard for entry. She was turned away. After years of wearing down metal frets and having pieces of his guitar rip off or malfunction during shows, Van Halen says he's built a guitar that even he can't destroy. On the Wolfgang, frets are fashioned of stainless steel, and metal gadgets are custom-made by a company that specializes in medical tools. Sections of wood are left unpainted so the instrument can breathe and age -- "like a Stradivarius," the 54-year-old musician explains with a degree of pride. We recently caught up with Eddie at his 5150 Studio, high in the hills above Los Angeles. It's where the album "1984" was recorded, along with every subsequent Van Halen record. The studio sits on seven acres, just a stone's throw from the Tudor mansion he bought in 1980. He and his fiancee/publicist, Janie Liszewski, scoot around the property in golf carts. The red, white and black-striped motif of his signature Van Halen guitar is painted on the walkway. The following is an edited version of the interview. CNN: You've been tearing guitars apart and redesigning them all your life, haven't you? Eddie Van Halen: It kind of started when I went to a Radio Shack-type of store in Pasadena. They had a 12-string guitar hanging there, and I didn't want 12 -- I wanted six. And so I asked the guy, "Could I take six strings off and try it?" And the guy said, "No, not unless you buy it." So I borrowed the money from my parents, bought it, took six strings off and voila -- did what I wanted. The guitar -- it's on the first album cover. It's called Frankenstein. I'm always tinkering with stuff. And basically, the new Wolfgang is a combination of all the years of tearing things apart, ruining things, creating things and coming up with things that I later found out I could patent. CNN: How many guitars have you accidentally broken on stage? Van Halen: On stage? (He shrugs.) During the last show, I actually tried to break a Wolfgang, and it wouldn't break. I picked it up and I couldn't break the damn thing. I threw it up in the air, and later put it out in the rain. I picked it up half an hour later, and it was still in tune. It pissed me off. CNN: The Wolfgang sells for about $3,000. Are you worried about introducing a high-end guitar when the economy is taking such a hit? Van Halen: I just don't think that way. I'm really not a businessman, so to speak. The only reason I do it is because people are always asking me where they can get what I use. CNN: Who are some of the musicians who have asked? Van Halen: Everybody uses my stuff. They just don't like talking about it. CNN: I'm told you can hear things that most people can't with the naked ear. CNN: I think a lot of men do! Van Halen: Obviously, I've lost a little bit, at very high frequencies -- which is kind of like a woman screaming at ya. CNN: "Ed, did you take the trash out?" "Can you wipe the dishes?" Are you hearing anything? Van Halen: What was that? (Laughs) I don't know. I'm blessed with a good pair of ears. That's how I fooled my piano teacher. I'd watch his fingers and I'd listen to it, and I just kind of basically learned it by myself. I can't read music. Instead, I'd do stuff inside the piano, do harmonics and all kinds of crazy things. They used to put me in these annual piano contests down at Long Beach City College, and two years in a row, I won first prize -- out of like 5,000 kids! The judges were like, "Very interesting interpretation!" I thought I was playing it right. But everything is open to interpretation. Imagine if Beethoven had a tape recorder. Then you'd know exactly what he meant. Maybe he meant (singing the opening notes to the Fifth Symphony), "Da da da da" instead of "Boom boom boom boom!" Who knows. CNN: Did you ever take formal guitar lessons? Van Halen: No. That's why I do all this crazy stuff. It's not taught. CNN: Do you think you'd approach music differently if you had taken guitar lessons? Van Halen: Probably. But you only have 12 notes. Do what you want with them. CNN: What kind of music do you listen to when you're at home? Van Halen: I don't listen to anything, really. Believe it or not, I'm so slammed with ideas, and the man upstairs overloads me with stuff, so I'm always doing my own thing. CNN: How was it having Wolfie on the road with you on the last tour? He was 16 when he took over as Van Halen's bass player in 2007. CNN: He's still in high school. Did he have a tutor on the road? Van Halen: Yeah, he had four hours of school and then a gig at night. He worked three times harder than any of us. CNN: How was it touring with David Lee Roth after all these years? Van Halen: It was great. Van Halen: No, no. Everything went great. It went smooth. CNN: Is there going to be another Van Halen tour? Van Halen: Oh, I know so. I mean, we're a band! That wasn't just a one-off thing. It's officially a band. And Wolfgang Van Halen is the bass player. Janie and I are getting married in June, and my son's going to graduate, and we'll pick it up after that. Obviously, I hope we record some new stuff. I'm writing, and just doing the same thing I always do. CNN: Is Wolfie going to be in the wedding? Van Halen: He's going to be my best man. My brother's marrying us. CNN: Oh, that's right! Alex (the drummer in Van Halen) is an ordained minister. Van Halen: Yeah. Reverend Al! (Laughs) We're going to do it right here in the backyard. Small, intimate wedding. ... We'll get a string quartet for part of it and a DJ for afterwards, although I'm not much of a dancer. CNN: Sounds like a very traditional, non-rock star-type of wedding. So many people can pick out an Eddie Van Halen guitar solo, but not a lot of people know who you are as a human being. 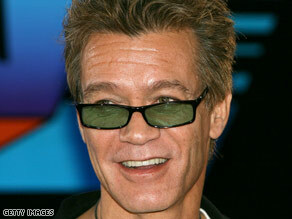 Van Halen: I just consider myself slightly left-of-center. I'm not your average bear. I -- what's the word? I'm not -- normal. (Laughs) I sound like Michael Jackson. I'm not like other guys. CNN: You hate interviews, don't you? Van Halen: Well, believe it or not, I really don't have much to say -- 'cause the equipment speaks for itself. And so does the music. CNN: If I play your new Wolfgang guitar, will I sound like you? Van Halen: Why would you want to sound like anyone else? Get your own guitar. They're available!